Ukraine’s ambassador to the United States, Oleh Shamshur, is confident that parliamentary elections in March only went to underline the support of Ukraine’s voters for the political leaders and parties that worked together to carry out the so-called Orange Revolution of late 2004, in which the results of elections that were widely held to be rigged by international observers were thrown out and a third round brought Viktor Yushchenko to power as president. 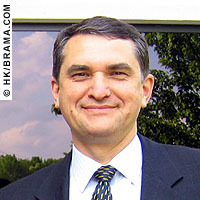 And while some commentators have pointed to President Yushchenko’s poor showing in March as a sign of popular dissatisfaction with his government’s pace in implementing the sweeping reforms he had promised in 2004, Ambassador Shamshur, in a recent interview with DiplomaticTraffic.com, said the election results show continued support for the Orange faction and what it stands for: closer relations with the West and an aggressive reform agenda. He argued that while people naturally expected to see rapid change in 2005, this had not been possible, as the government had needed the time to implement legislative and other reforms that were necessary prerequisites to increased foreign investment and other evidence of political and economic improvements. He noted that the March elections were “the last test of Ukraine on the road to democracy,” and that the universal praise for Ukraine’s handling of a free and fair vote were in themselves evidence that Ukraine has come of age as a truly democratic nation. The high turnout, some 68 percent of eligible voters, was itself an endorsement of the system, he said. He noted that President Yushchenko was true to his own principles by insisting that the elections be transparent and fair. “The post-Soviet period of Ukraine is over,” the ambassador said. This means that Ukraine should no longer be judged in the context of where it came from in its recent history, as part of the Soviet Union, bur rather by what it has to offer the world on its own terms, whether as a strategic partner, in NATO for example, a good candidate for entry into the European Union, or as a promising destination for international investment. The ambassador stressed that Ukraine is now on an unwavering course to get closer to the West, albeit while maintaining good relations with Russia and other countries in the former Soviet Union. He said all of the major parties agree with the idea of Ukraine joining the European Union, and only few openly opposed NATO membership. Commenting on the dangerous flare up with Russia over gas prices at the end of last year, Ambassador Shamshur said the crisis had been a “wake-up call to Ukraine,” alerting it to the need to deal with the energy issue soon. He said that Ukraine’s leaders recognize that the country has to pay market prices for gas eventually, but they want to negotiate agreements with Russia that allow for a in incremental increase in prices to reach that point, several years hence. For Europeans, who are increasingly dependent on Russian gas, much of which is shipped through Ukraine, the tiff over gas prices and Russia’s decision to turn off supplies to put pressure on Ukraine to accept higher prices, sent jitters through the corridors of power. What if Russia chose to blackmail a European customer to get something it wanted? Speaking of the close ties between Washington and Kiev following the Orange Revolution, Ambassador Shamshur said, “We see the relationship [with Washington] as becoming a strategic partnership.” This partnership manifests in several ways. Ukraine and U.S. are actively cooperating on stopping proliferation of weapons of mass destruction, the war on terror and promoting human rights, enhancing energy security, combating organized crime and trafficking inhuman beings, as well as mitigating consequences of the Chornobyl disaster. There are four areas in which obstacles to closer ties and greater investment have recently been removed. One is the ending of sanctions imposed in 2000 for intellectual property rights infringements. The second is recognition of Ukraine as a market economy, which creates more favorable conditions for an anti-dumping investigation. The third is a bilateral protocol through which Washington is helping Kiev gain entry to the World Trade Organization. Finally, the Jackson-Vanick restrictions have now been lifted. Ambassador Shamshur said it is now up to the Ukrainian and American business leaders to work together to achieve success, now that most barriers to business have been removed. On Ukraine’s plate is continued deregulation, judicial and tax reform, stepped up fight against corruption.